Cities are increasingly loaded up with technology. Sensors now enable managers of urban water and sewage infrastructure to spot leaks as they happen. Meter maids no longer have to tromp around all day looking for violators — with new video and analytical tools, transportation departments can locate parking offenders in real-time. Cites prone to flooding now have robust-technology-enabled early warning systems. Ubiquitous security cameras can lead to rapid arrests. And smart phone apps enable citizens to report potholes and other problems in the urban environment as they find them. Many technologies aim to improve the responsiveness or resilience of city services. And while many of these new systems are sold as an easy, all-encompassing solution, like any software, they are high maintenance. Smart city technologies certainly can’t fix all of a city’s problems, particularly deep-seated structural issues like inequality and displacement. But one technology that could actually live up to some of the hype is Placemeter, which aims to provide an “accurate, flexible, and continuous measurement of how people and vehicles move about your city.” Stumbling upon the technology at the Smart Cities Week in Washington, D.C., I was mesmerized by the little red dots moving through an urban plaza. I discovered that each red dot is a person walking through the plaza in real-time. Seen above is a view of people moving through Union Square in New York City, a place Placemeter says it’s collecting data on and offering for free via their website. Josh Gershon with Placemeter explained how his firm’s technology can use either existing video feeds or their own sensors, which will be available in October of this year, to turn video into data that can be analyzed with a dashboard. Their software looks for certain shapes in the video feed — cars, trucks, pedestrian, bicyclist — and records their numbers along with path and speed. 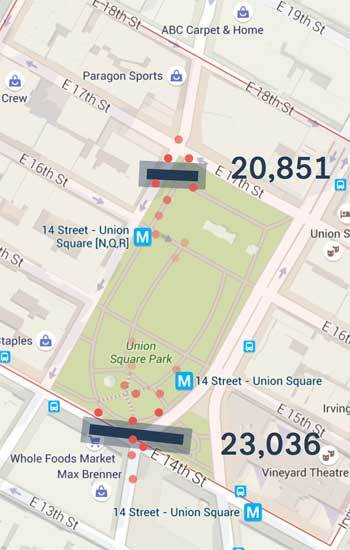 Placemeter anonymizes all the data so people only appear as dots. As Gershon explained, Placemeter views the retail sector as a primary market for their tools. While stores almost always collect numbers on how many people entered and bought something, few understand “all the customers they missed and why.” Retailers could use Placemeter to see if various advertisements, window fronts, sounds, or even scents work in attracting people into retail environments. In the same way, architects could use the technology to see how people navigate building entrances. And landscape architects could use Placemeter to conduct pre- and post-occupancy surveys of their designed landscapes and find opportunities for improvements based on pedestrian flow. Transportation officials could spot congestion and blockages and create remedies, or find out how bicyclists are actually getting around (many aren’t using the bike lanes). Developers and city government clients could find out if their expensive investments in planning and design worked out as they hoped. Given software like Placemeter can be scaled up to the city-scale, planners could even get a sense of broader use patterns. Still, it’s still important to actually sit, watch, and analyze people using a public space. William Whyte in The Social Life of Small Urban Spaces and, more recently, Jan Gehl in Cities for People make the case for taking the time to really understand all the nuances of how different kinds of people use a park, plaza, or street. While Placemeter provides useful aggregate data in real-time, it can’t tell who’s older and needs to find a bench, who’s young and wants to play in the water, or who is really busy and looking for the shortest route from A to B. Perhaps both a qualitative and quantitative approach together can provide some new insights that yield better urban design. An interesting article about how to use technological advances in data collection for the field of landscape architecture. While the last paragraph will always be relevant (the experience of being on site and observing is necessary to design), data could be used to measure responses to changes in the landscape and analyzing how people and traffic move over a longer period time to make sure we design more accurately.